It is always a pleasure to deal with the camping industry. 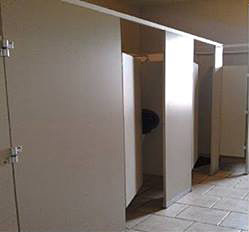 Many campgrounds have been updating their washroom facilities over the years and the Cedar Rail in Scone is no exception. A part of the Scone community since the last 1800’s Cedar Rail Camp really came into its own in the 1960’s when a chance inquiry about having a Sunday school campout started a whole new way of life! In 1991 the camp was sold to the Evangelical Lutheran Church of Canada in 1991, who continued to develop the camp. Part of this development was a major renovation of facilities in 2013, especially the washrooms in the pool area, by Buddsteel. Recently Elaine Fischer and family spent the long weekend at Cedar Rail Camp and had a super time. Friendly service, great rates, lots of activities, fun outdoor play spaces for the kids and clean modern washrooms, of course!. Cedar Rail Camp, check them out!